The MPU-9250 is the latest 9-axis MEMS sensor from InvenSense®. This replaces the popular EOL'd MPU-9150. InvenSense® lowered power consumption and decreased the size by 44% compared to the MPU-9150. "Gyro noise performance is 3x better, and compass full scale range is over 4x better than competitive offerings." 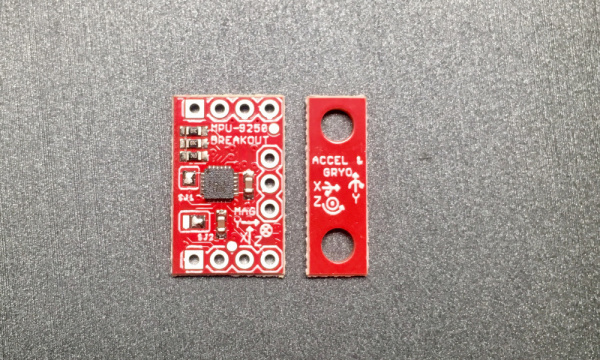 The MPU-9250 uses 16-bit analog-to-digital converters (ADCs) for digitizing all 9 axes. The System in Package (SiP) combines two chips: the MPU-6500, which contains a 3-axis gyroscope, a 3-axis accelerometer, and the AK8963, a 3-axis magnetometer. 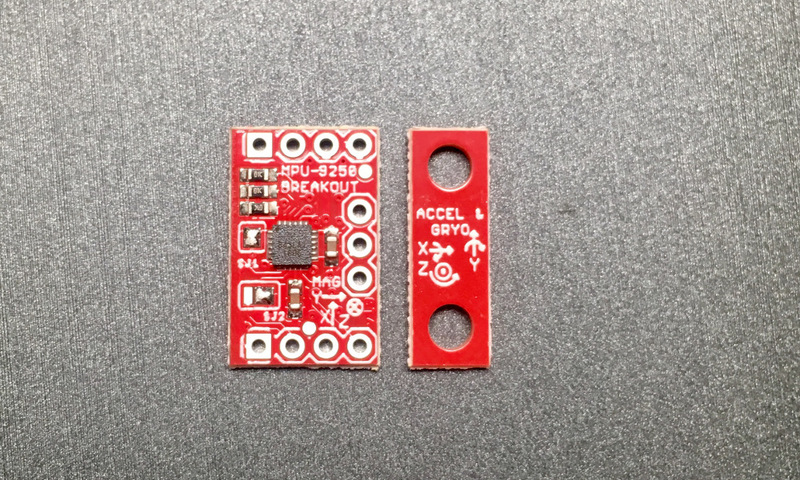 The board is designed to be smaller than some of our other offerings to fit in smaller projects. To achieve this, the PTHs are wrapped around the boarder of the PCB in three rows of three or four. The top row (J1) is all one need to get most of the functionality of the IMU. 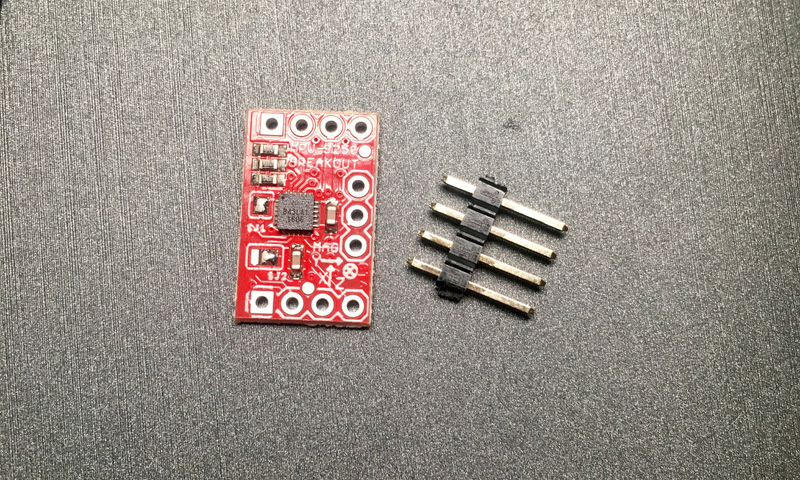 These include the I2C and power interface. If space were really tight, one could take a saw and carefully remove all of the other PTHs. The second most likely to be used set of PTHs are found along the bottom (J3). This includes the address pin, the interrupt pin, and the IO voltage supply for easy interface with a more modern 1.8V processor. The third, non-breadboard-compatible row (J2) is used for features like running other I2C devices as slaves to this one. 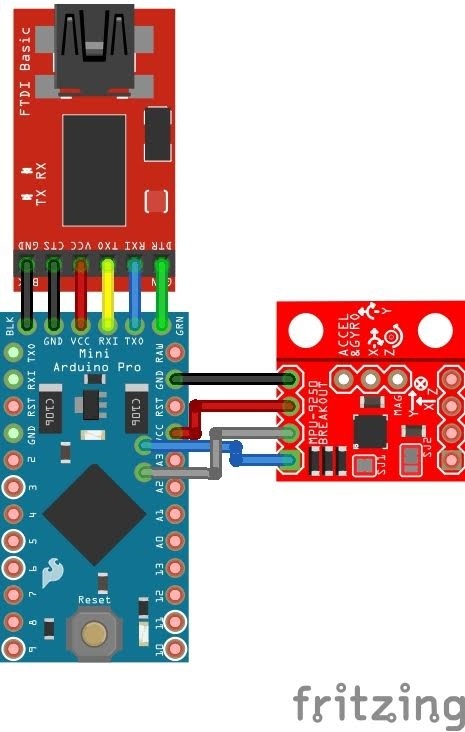 For prototyping with these connections, throw your connections on top like you would with an Arduino Pro Mini or similar product. FSYNC Ground reference Frame synchronization digital input. Connect to GND if unused. 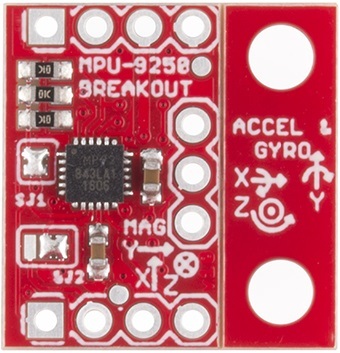 The MPU-9250 Breakout has two solder jumpers, SJ1 and SJ2. SJ1 comes pre-soldered to short VDD and VDDIO. This reduces the number of power supplies to one with out requiring an external jumper. If the core and IO need to be supplied with different voltages, remove the solder from SJ1. SJ2 is a two way jumper that comes pre-soldered to connect AD0 to ground. 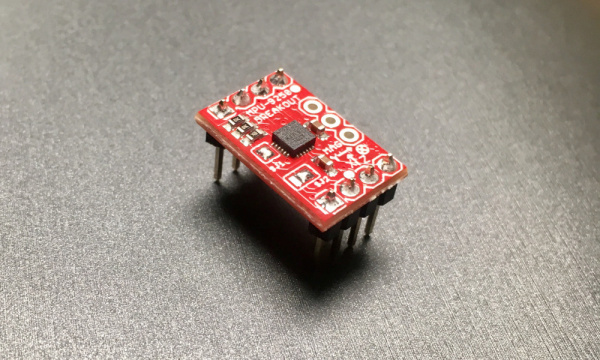 This sets the I2C address to 0x68. It also leaves the PTH for AD0 disconnected and floating. 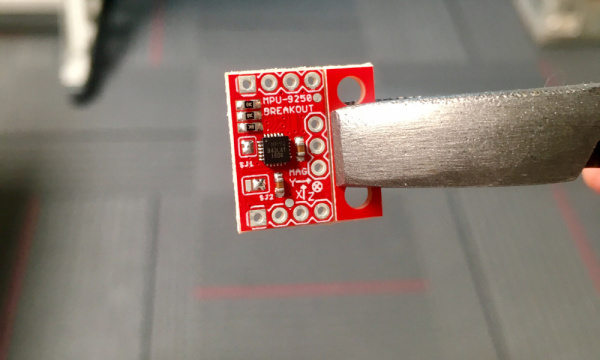 If the solder is moved to connect the center pad with the pad on the left, then the AD0 PTH needs to be connected high or low to chose the I2C address. As stated earlier, one of the design goals for this breakout was to make the board small. Some projects will require mounting holes, so we threw them on the right side of some v-score on this board. Since the board is only ⅔" wide and there isn't enough mass to the left of the mounting holes, there isn't much of a bending moment. If you plan to use a breadboard, or secure the IMU securely to a project with something like epoxy, the mounting holes can be snapped off. As shown in the following image. The pliers I had on hand made super easy work of this. The edge of a table should work fine too. The MPU-9250 breakout board runs on 3.3 VDC, so a 3.3V USB to UART bridge such as the SparkFun FTDI Basic Breakout - 3.3V or the SparkFun Beefy 3 - FTDI Basic Breakout can be used to power and bridge communication with a micro controller. In this case an Arduino Pro Mini 328 - 3.3V/8MHz was chosen so logic level translation isn't needed. Only 4 connections are needed for I2C communication. For stability in the breadboard, another four pins were soldered on: VDDIO, AD0/SDO, CS, and INT. Here is the final setup used for testing. Note: The example sketch and library are HEAVILY based on the work of Kris Winer. His original work can be found in his GitHub repository. display.setTextSize(1); // Set text size to normal, 2 is twice normal etc. // data to calculate bias and scale. // declination, looking down on the sensor positive yaw is counterclockwise. // pitch, and then roll. // which has additional links. 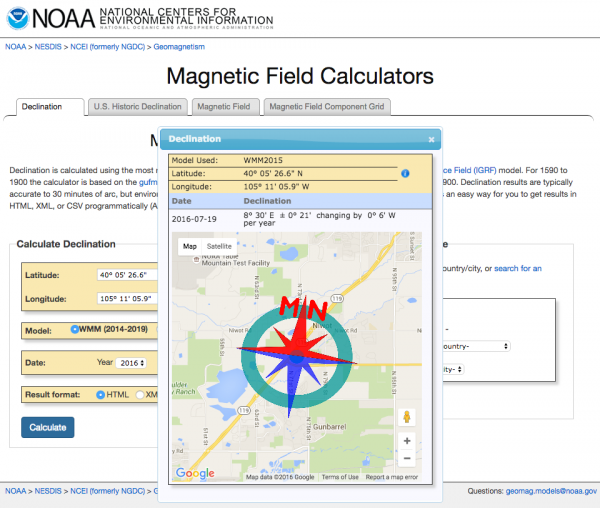 The AHRS needs to know where you are located to convert magnetic north to true north. I used the combination of two services to find the current declination of our offices; Google, and NOAA. This may or may not be ideal in your country. The first thing I needed were the latitude and longitude of the office. 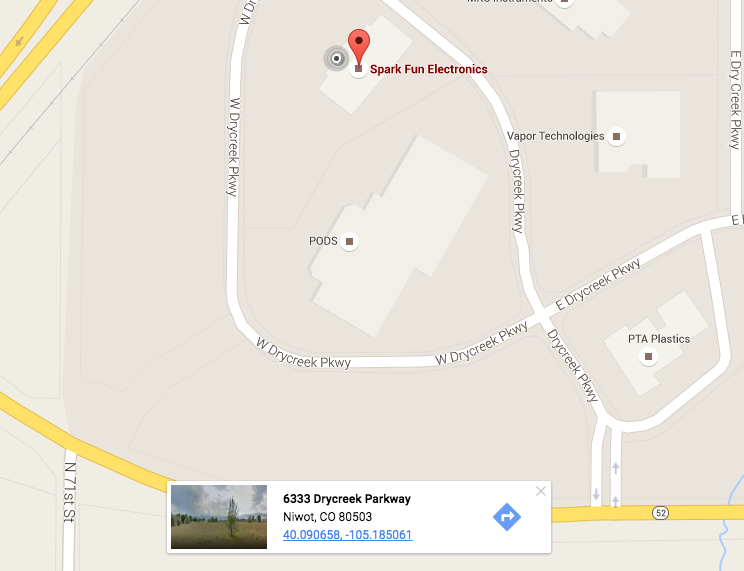 Searching for SparkFun in Google Maps shows a red pin on our building. Clicking near the front door, but not on the existing pin dropped a new pin which also made a card appear bottom center. The bottom of this card contains a link to a search of the latitude and longitude marked by the new pin. Clicking on the link in the card brings up a page showing the latitude and longitude in both the decimal degrees (DD) and degrees minutes seconds (DMS) forms. I find sign errors easier to avoid by using DMS form Google provides with the since I'm not intimately familiar with the WGS 84 coordinate reference system (CRS). The included cardinal directions are handy and required by the next tool. The second tool is the default magnetic field calculator on NOAA's website. Enter the coordinates found in the previous step into the latitude and longitude inputs. The Calculate button will trigger a dialog box with the results to appear. If the results appear on the Google map where you are expecting them, then you chose the correct directions with the radio inputs! Note that the declination here is currently 8˚ 30' E. Also note that the image on the map shows magnetic north to be east of true north. The provided DM format needs to be converted to DD format for the code. There are 60 minutes per degree, 30 of them is 30⁄60 of a degree, or 0.5˚. The declination in DD format is thus 8.5˚ E. Update the code in the example sketch around line 391 with the declination for your desired location. For more information about the MPU-9250 Breakout, check out the links below. Many of the advanced features of the MPU-9250 are only accessable by agreeing to a pages of licensing terms and logging in as a developer to get access to Embedded MotionDriver 6.12. This approach isn't super Arduino friendly. At power up 3062 bytes of undocumented hex needs to be loaded into the MPU-9250. That binary combined with the driver and any code that does something with the sensor data quickly maxes out smaller microcontrollers. Feel free to register and play around if you want to take this product further. A customer of ours shared his great tutorial on Affordable 9-DoF Sensor Fusion. 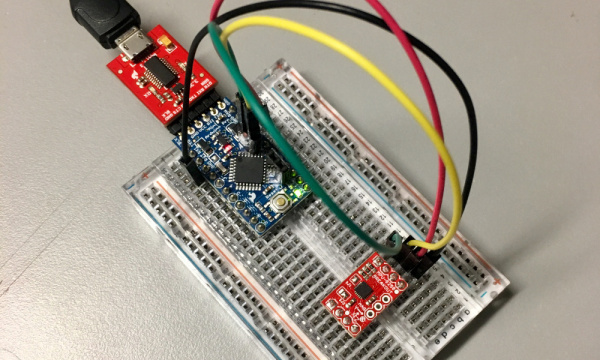 Check it out for more info on sensor fusion.